This video will make your palms sweat and your heart race. This is a climber named Dan Osman. Notice he's climbing without rope. Watch for the part where he does a "dyno" meaning all parts of his body come off the rock. He's climbing a 5.7 cliff which is not technically that difficult, but to do it at this speed and with no "pro" (protection) is a deathwish. Extremely dangerous climbing, but riveting to watch. He's got a pretty fascinating story- he was of course a dare devil. Loved to take this sport to the extreme, and often did rope jumps- really just long jumps off cliffs, allowing the rope to catch him. The story of his death is pretty insane. He ignored his intuition and it cost him his life- he took a risky jump off a cliff on a rope that had been exposed to the elements for over a month. Insane. And to round out the videos, here's my favorite male climber and arguably the best in the world, Chris Sharma. Love love love him. This route, called "Realization" was at this time, the single hardest climb ever established and completed, a 5.15a difficulty level. Watch his finger stacking technique and the tiny fingerholds. The hardest I ever climbed was 5.10b (denoted five-ten-b). To give you perspective, a steep hill would be about 5.2. A beginner could resonably climb 5.6. The hardest route ever was 5.15a. Here's a rather unimpressive picture of someone else on the route in Foster Falls, TN on the route named "mammplitude"
So you are missing Tennessee stone? You know your family is always welcome to visit. Andy is climbing every chance he gets. We miss you guys. Say hello to Matt and Gray. CARRIE!! I miss you guys! I really wanted to post some video of Andy- do you have any? Definitely missing the TN stone and climbing with both of you. I still climb my door frame- the students get a kick out of me wedged high up in the door of our classroom. 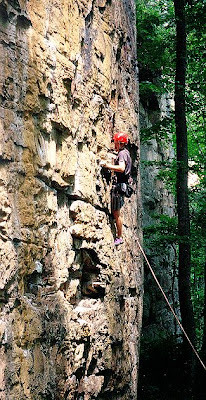 I am totally climbing again in the spring. Let's make a date and we'll come down. I was having such good memories of Leida and Foster Falls yesterday. Of course our home is your home too! First off, you have a great blog. Those guys are crazy! Amazing videos. Thanks mozam!! I knew immediately where you were from! very cool of of you post here, thanks!